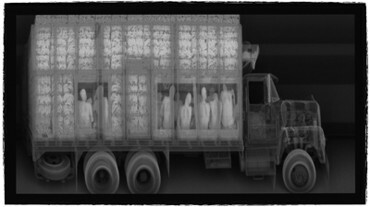 Use of X-ray scanners by border security and police at checkpoints reveal ghostly images of smuggled immigrants inside cargo trucks. As tens of thousands of residents fled New Orleans and billions of dollars in aid poured in, the demand for laborers to rebuild Louisiana, especially cheap laborers, soared. It was the perfect scenario for profiteers in human trafficking. Among the victims were hundreds of workers from India who each paid recruiters up to $25,000 on the promise of jobs and visas if they came to America. Instead of opportunities and new lives, they found themselves toiling as slave laborers under barbaric conditions in shipyards while confined under inhuman conditions. And they were billed for their enslavement—more than $1,000 a month was deducted from their meager earnings for food and shelter. After the abuses were exposed in 2007, a number of victims brought suit against their traffickers in March 2008 with help from the American Civil Liberties Union and the Southern Poverty Law Center. The target of the legal actions was Signal International LLC, a Mobile, Alabama, shipbuilder accused of mistreating 500 Indian pipe fitters and metalworkers hired to repair damaged offshore oil rigs in Texas and Mississippi. Promised that their guest worker visas would be converted to green cards enabling them to become permanent residents, the workers borrowed the huge “recruitment fees” from Signal to work for Signal. Upon arrival in the United States, the workers found themselves subsisting on contaminated water and cooked pigeons in hellholes, surrounded by armed guards. They suffered disease and infection and had to bear the costs of their own medical care. Assigned to the most dangerous and difficult jobs, they were threatened with deportation. The Indian workers never received their visas, but a few escaped from the labor camps and reported to authorities, resulting in raids by Immigration and Customs Enforcement agents in March 2007 that freed those still enslaved. Trafficking and racketeering lawsuits were subsequently filed against Signal International and its network of recruiters and labor contractors in an effort to gain restitution for those enslaved, the most recent in August 2013. “These cases graphically illustrate the need for stronger regulation of both the U.S. companies that hire guest workers and of their labor recruiters here and abroad,” said Bill Beardall, director of Equal Justice Center at the University of Texas Law School, which filed the 2013 lawsuit on behalf of 16 workers.